Long, long ago, in the city of Bethlehem, there lived a lovely girl whose name was Ruth. 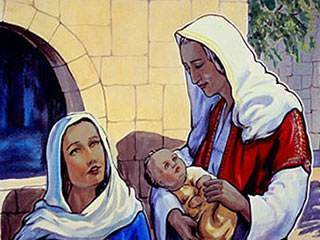 Ruth had come to Bethlehem from a far-off land, to care for her mother-in-law Naomi, who was poor, and sad and lonely. "I will work for you, Mother," said Ruth to Naomi. 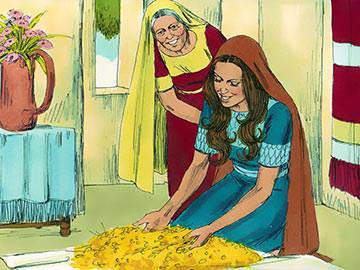 The harvest was golden in the fields when Ruth came to Bethlehem. So she said to her mother, "Let me now go to the fields and pick up the leftover grain there." Now the kind custom of those days was to allow poor people to go to the fields and gather the barley or wheat from the corners, and keep that for themselves. The ‘gleaners,’ as they were called, were allowed to pick up the ears of grain that fell when the reapers were tying up the sheaves. And when the harvest had been cut by the scythes [big blades], the gleaners might go and gather any ears that were left. 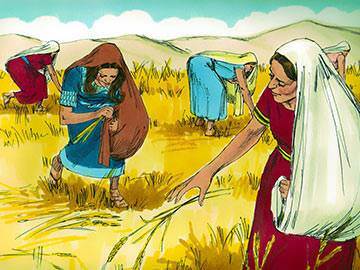 Ruth wanted to be a gleaner, and Naomi said, "Go, my daughter." 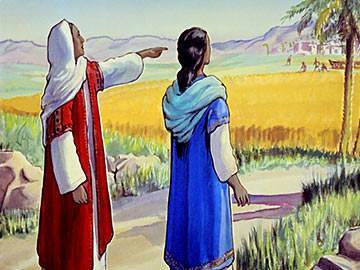 She went to the fields that belonged to a rich farmer, Boaz. 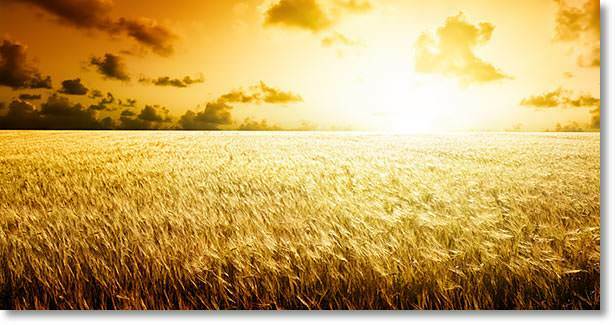 The farmer came and said to the reapers, "The Lord be with you," and they answered, "The Lord bless you." 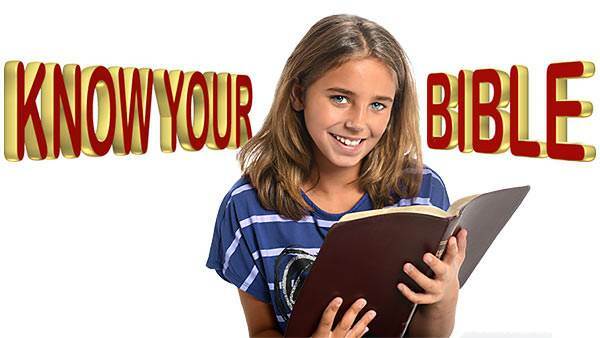 Then Boaz said to his foreman who was set over the reapers, "Whose young woman is that?" 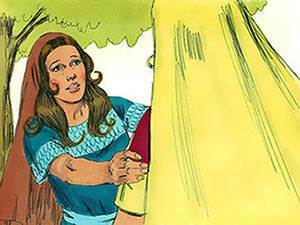 The servant answered, "This is Ruth who came from Moab to care for Naomi." 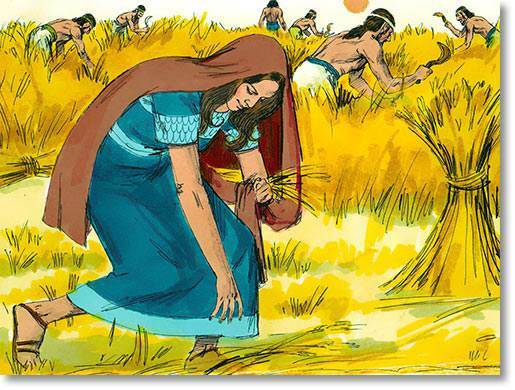 Then the farmer turned to Ruth and said, "Glean in my field as long as you can. If you are thirsty, drink from the water jars the men have filled." 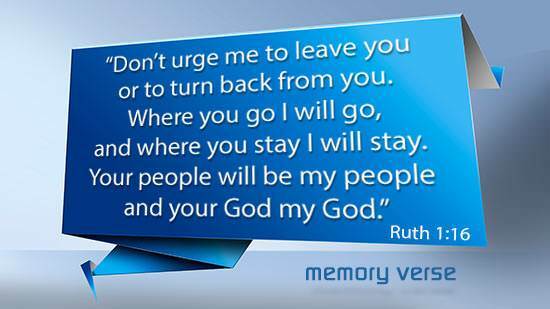 And at meal-time Boaz said to Ruth, "Come over here. Have some bread and dip it in the wine vinegar." 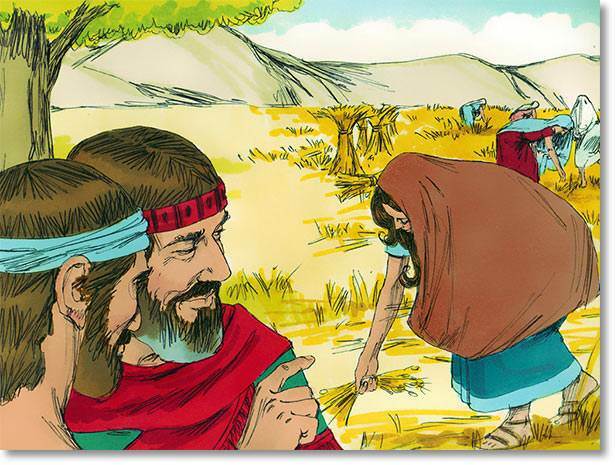 And when she went to glean he said, "Let her glean among the standing sheaves, and pull out some for her on purpose." So Ruth gleaned in the field until the evening, and she beat out the ears that she had gleaned, and there was a great amount of grain. Her mother was delighted, and told her that Boaz was a relative of theirs. Every day while the barley harvest lasted Ruth gleaned in his field. And all through the wheat harvest, too. 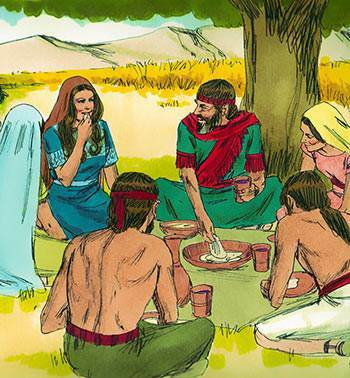 By and by Boaz took Ruth to be his wife, and Naomi went to live at the cozy farm-house, too. And one day Naomi held the baby son of Ruth and Boaz in her arms.